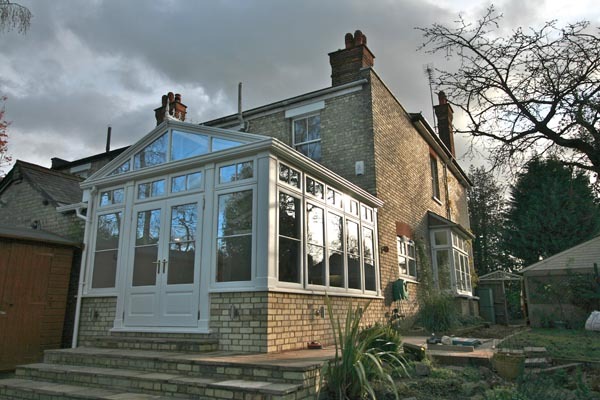 The orangery in Barnet is complete, although only partly furnished. It appears to have been annexed by one of the younger members of the family and their new territory reclassified as a playroom. The orginal CAD design is here, the final result looks exactly as intended and really fits in well with the existing extensions. This hardwood conservatory is almost complete, a final clean and tidy up for us, then the kitchen company still have some bits to do. You can see that the reclaimed bricks we have used on the walls and steps have really helped match the conservatory with the main building. The hardwood windows, doors and posts are great features in their own right, but again match those on the house. We should be able to get some really good photos of this once everything is finally complete, the garden is in bloom and the sun comes out! The granite worktops have been fitted and the kitchen is nearly complete. We just need to hang a door into the utility area. The kitchen company need to get a move on and get finished, the large fridge currently sitting in the middle of the conservatory is not due to stay there! Once fully complete, it will be a spectacular room, very spacious and light. The hardwood conservatory will be a tremendous addition to the property. 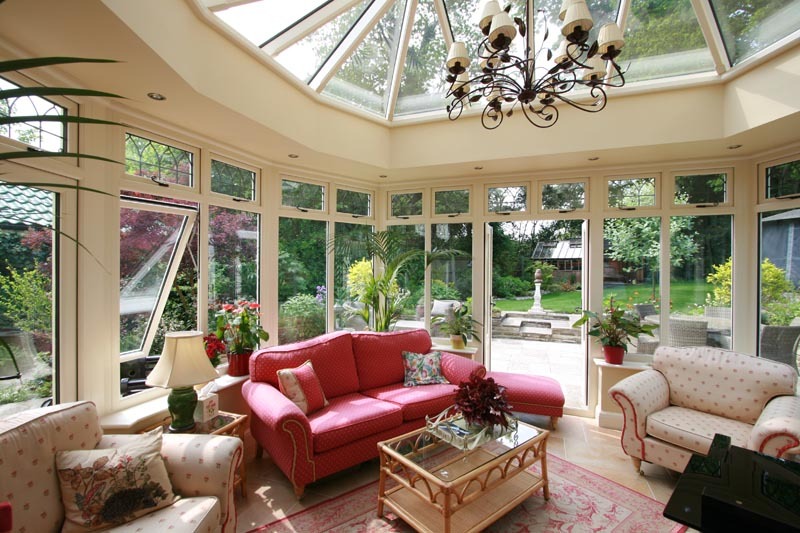 The orangery is now completed and furnished. The clients have chosen a tasteful chandelier which ties in with the black ironmongery used on the windows and doors. The furniture is relaxed, yet smart the colours subtly co-rdinate with the decor of the room. 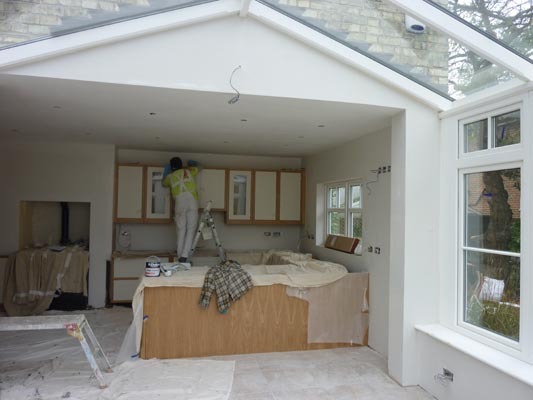 In some cases it is possible to paint the walls, or at least get a mist coat on before the kitchen is fitted. 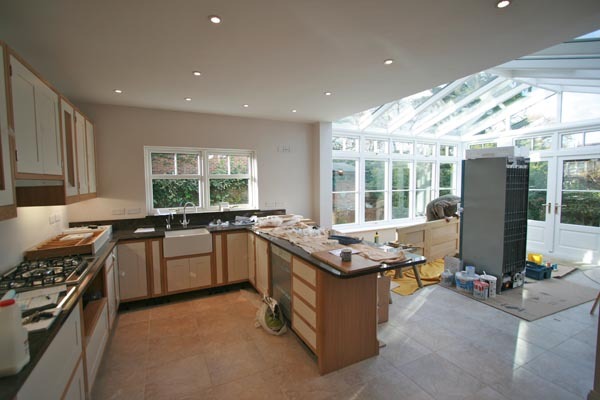 However on this job because the walls in the existing kitchen needed to be re-plastered, there was no time between when the plastering was done and the new kitchen units were fitted to paint. It was important to get the new units installed as soon as possible so the granite worktops can be measured for. These final measurements can only be taken once the units are in place. As you can see, our decorating is taking great care with protective sheeting and the new paint is making the room look lighter. The granite work surfaces should arrive next week.